ABOVE: Two boys from Münster pose before the arcades of the central shopping district. Here and on the following pages, we've provided assorted pictures from Münster with captions that include tourist information and, in some cases, Web links. 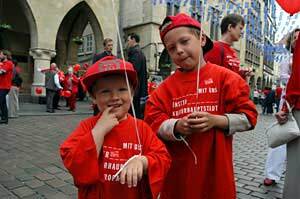 These images were supplied by the City of Münster's press office, which came to the rescue after we lost several hundred digital images that we'd taken with our own camera.